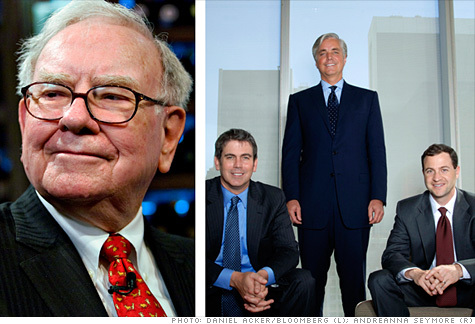 Warren Buffett and (l to r) Protégé Partners' Scott Bessent, Jeffrey Tarrant, and Ted Seides. Berkshire Hathaway’s chairman won the 2010 race for investment returns, but Protégé Partners retains the long-term lead. FORTUNE — We’re three years into Warren Buffett’s 10-year bet with the hedge fund community, and the race has narrowed. For the second year in a row, Buffett’s horse in the contest — an S&P 500 index fund — did better than the average return booked by five funds of hedge funds picked by Protégé Partners LLC, a New York money-management firm. The Protégé pack, though, built up a big lead in the first year of the bet, the financially torturous 2008, and is still ahead. This contest, to look back briefly, began when Berkshire Hathaway (BRKA) chairman Buffett, no fan of the transaction and management fees that cut the returns of hedge fund investors, said publicly in 2006 that in a long-term bet he’d back an S&P index fund against hedge funds. Ted Seides, a Protégé partner, picked up the idea, and a bet was negotiated. The Protégé camp may be out front, but that is not to say either side has done well: Neither is in the black for three years. In a sense, the only winners in this bet so far are the managers of the funds of funds, who’ve been paid fees even if their investors have lost money. In the wicked start-off year, 2008, Vanguard’s Admiral shares — the index fund carrying Buffett’s colors — fell by a dismal 37%, and Protégé’s picks had an average loss of “only” 24%. In the next year, 2009, the S&P index gained 26.6% to the funds’ 16%. And last year’s results — being announced here for the first time — showed the S&P rising by 15% vs. the funds gaining, on average, 8.5%. The three-year record, therefore, puts the Protégé funds of funds in the lead with a loss of 4.2%, against the S&P’s even greater loss of 8.18%. The year-by-year results display unsurprising patterns: Given the ability of hedge funds to sell short and invest in financial instruments other than stocks, they are the odds-on favorite in a bad year for the market — a 2008, for example — than the long-only S&P. Conversely, in a good year for the market, when many funds may continue to hedge with part of their assets, the S&P has the advantage. Followers of this bet will remember that the names of the five funds of funds have never been disclosed — though Protégé itself runs funds of funds and the biggest of these, called Protégé Partners LP, may be assumed to be among the five. Another reminder: The stake is $1 million — so to speak, because there’s a present-value factor built into the bet. At its start, each side put up $320,000, with the total going to buy a zero-coupon bond that will be worth $1 million when the 10-year competition is over. That money is to go to the charity that each side designated at the outset. (Buffett’s charity is Girls Inc. of Omaha; Protégé’s is Absolute Return for Kids). The party holding the zero-coupon bond is the Long Now Foundation of San Francisco, whose wish to promote long-term thinking led it to set up a mechanism called Long Bets. On its site, www.longbets.org, you can read the predictions that various prognosticators have made about who will win the Buffett-Protégé contest. There are no recent posts because Long Bets ran into a spam problem and for a time wouldn’t accept comments. It will take them now, though — so you’re invited to weigh in. The writer of this article is a longtime friend of Warren Buffett’s and the editor of his chairman’s letter in the Berkshire annual report.